The city’s largest corporate arrival this year is planning to make its move within the next few weeks. In June, Henkel Corp. will open its North American consumer-goods headquarters at 200 Elm St., according to a billboard advertisement posted a block away on South State Street. The company is relocating its laundry, beauty and home-care divisions from Scottsdale, Ariz., a transfer announced last October. 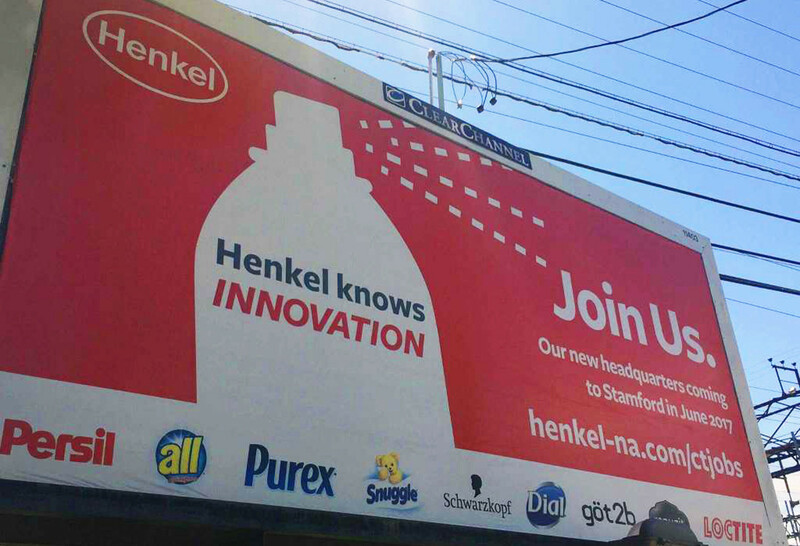 “Henkel knows innovation,” reads the message inside the silhouette of a detergent bottle in the ad. “Join us,” says another line in the ad, which contains a link to listings for Henkel jobs in Connecticut. A similar billboard ad is posted on Greenwich Avenue, a few hundred yards from the downtown Metro-North train station. Messages left for Henkel were not immediately returned. Building and Land Technology, the landlord of 200 Elm St., did not respond to a request for comment. Henkel will occupy 155,000 square feet at 200 Elm St., which comprises part of the BLT Financial Centre complex. The company will use all of the sixth floor and most of the fifth floor. The company plans to start with 266 Stamford-based employees and expand to about 500 by 2018. In addition to offices, Henkel’s space will include a laboratory for the development and testing of its beauty products. The laboratory will include a center focused on product formulations and packaging, a clinical testing facility and a “hair learning” salon, according to the company. The company’s roster of consumer-goods brands includes Persil, all, Purex, Schwarzkopf, Snuggle, Dial, got2b, Renuzit and Loctite. In addition to the transfer of its Arizona operations, the company is also moving Wilton-based Sun Products, which was acquired in September, to Stamford. Up to $25 million in state loans and tax credits and a $30 million investment from Henkel are funding the creation of the Stamford hub. Henkel’s global headquarters are in Dusseldorf, Germany. The signing of Henkel marked the second recruit for the BLT Financial Centre, a property that covers some 590,000 square feet, since it was acquired in 2012 by BLT. In November 2014, professional-services giant Deloitte moved into about 120,000 square feet in the clock-tower building at the adjoining 695 E. Main St. Audit, tax and consulting firm RSM also plans to move to 200 Elm St. later this year. It will lease 27,800 square feet on the second floor. When BLT purchased the Financial Centre, the property stood vacant following the departure of Gen Re a couple years earlier for a new home on Long Ridge Road. BLT then embarked on a major renovation that included splitting the structure into two connected buildings and creating a large atrium and separate entrances. BLT’s other Stamford holdings include most of the Harbor Point mixed-use development and the Silicon Harbor office complex in the South End and the Long Ridge Health and Science center on Long Ridge Road.